What is the Big Mouth Gutter Outlet? The Big Mouth gutter outlet is an ingenious solution to the all-too-common problem of gutter clogging. Developed by Innovative Gutter Solutions, LLC and exclusively available from authorized installers, Big Mouth is an oversized outlet that provides a significantly wider opening for leaves and other types of debris to pass through. This gutter outlet is a must-have for anyone who wants to say goodbye to gutter clogging as well as the dangerous chore of gutter cleaning. One of several next-generation gutter accessories that is distributed by Innovative Gutter Solutions, LLC, Big Mouth can transform a gutter system that is perpetually getting clogged into one that remains free flowing. Compared to standard outlets, Big Mouth has a 500 percent larger flow capacity. 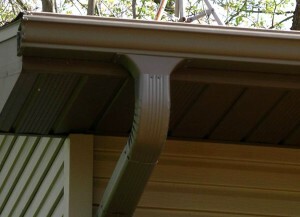 Big Mouth creates a smooth transition between the horizontal gutter channel and the vertical downspout. In doing so, it encourages debris to exit the gutter channel instead of remaining inside it and accumulating. This state-of-the-art outlet is compatible with downspouts of difference sizes and is made of heavy-duty molded PVC for long-lasting performance. If desired, Big Mouth can easily be painted to match a gutter system of any color. For additional information about the Big Mouth gutter outlet, contact Innovative Gutter Solutions, LLC today. We will be more than happy to put you in touch with an authorized installer of this product serving your community. We also distribute seamless gutters, gutter covers, and other high-quality gutter products.